For the past couple of years now, a fungus called Xylaria polymorpha has been munching on the buried roots of a beheaded tree on my parents' front lawn. In the grass surrounding the stump, X. polymorpha sends up a thicket of charcoal club-like mushrooms every summer. They look kinda like a dead man's fingers, which not coincidentally happens to be a common name for the fungus. 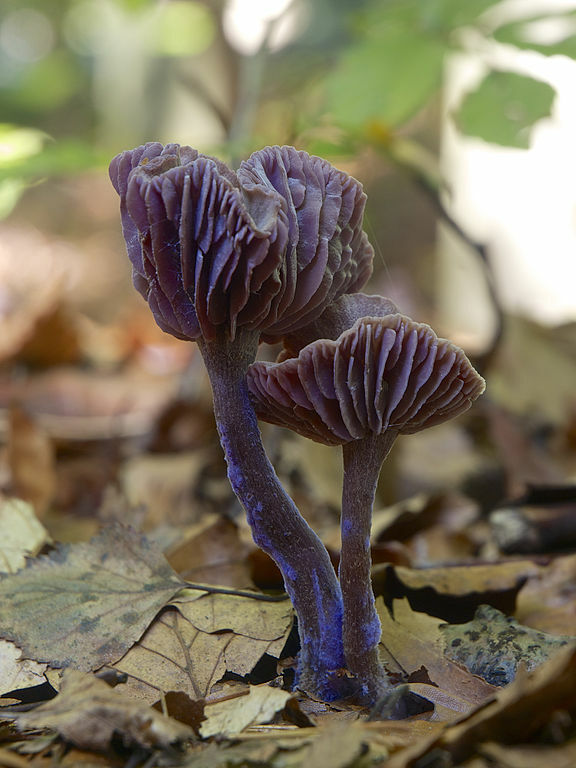 Many fungi are closely associated with death. Saprotrophic fungi like X. polymorpha help ensure terrestrial ecosystems run smoothly by spreading out nutrients from larger dead organisms. 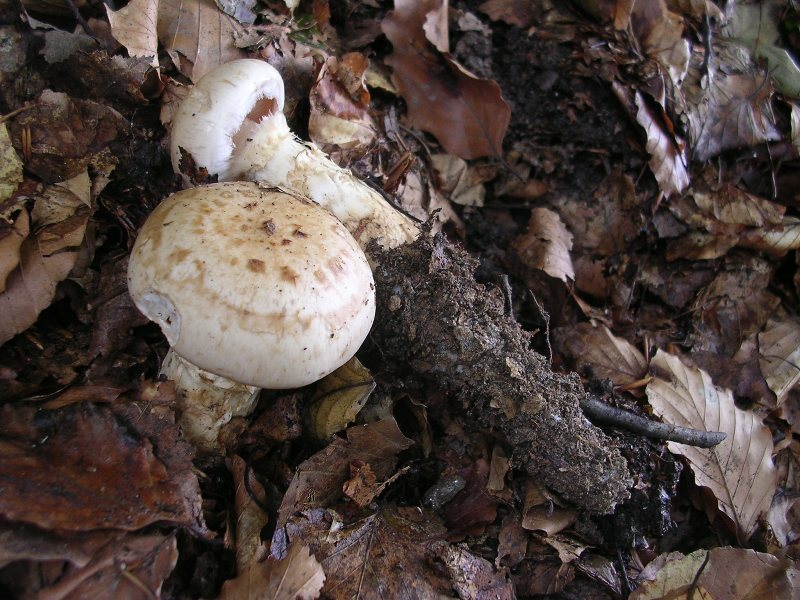 Other fungi are pathogenic, meaning they consume and often kill living things. Ammonia fungi are a group of death-loving fungi known for growing and producing their mushrooms (spore-releasing structures) in forest soils enriched in ammonia and other nitrogen-containing compounds such as urea and amino acids. Nitrogen is a big deal since it's found in all sorts of biological compounds (e.g. proteins, amino sugars, and nucleic acids) and is often the most difficult nutrient for organisms to acquire enough of to live normally. Decomposing animals are a great source of ammonia and other usable forms of nitrogen (released as arthropods and bacteria break the corpses down), so ammonia fungi have made it their business to grow near them. In addition to being into cadavers, ammonia fungi also their sprout mushrooms near latrines (places where animals frequently use the bathroom) since pee and poop both contain nitrogen compounds. For example, Hebeloma radicosum sometimes sets up shop in deserted mole middens (latrines). Moles are carnivores (they eat earthworms and insects), which means their excrement contains a lot of nitrogen. They tend to poop underground in middens near their nests, and if too much waste accumulates they are forced to move somewhere else. It's thought H. radicosum helps to clean up decomposing mole poop by transporting the nutrients it contains to the surface (in the form of mushrooms) and to the roots of nearby plants, with which the fungus forms a symbiotic relationship. Although ammonia fungi seem to prefer mammal corpses or waste piles, Laccaria bicolor was found in Japan growing on waste piled up by giant hornets near their underground nest. In related news, giant hornets exist and are terrifying. A classic method of studying ammonia fungi involves spreading urea, ammonia, or other nitrogen-containing compounds on a patch of land. This encourages any ammonia fungi present in the soil to grow and produce mushrooms. The fungi have been spotted in forests all over the world, indicating they're pretty much everywhere and just lie in wait until an animal dies or deposits some nitrogen-rich waste. The association of ammonia fungi with dead bodies, particularly those of mammals, makes them interesting to forensic archaeologists and criminal investigators. At this point, a lot more research needs to be done in order to use them to determine things like how long a body has been buried. It's also worth noting many of the ammonia fungi can live happily away from any concentrated source of nitrogen, so their presence doesn't necessarily mark a hidden grave.